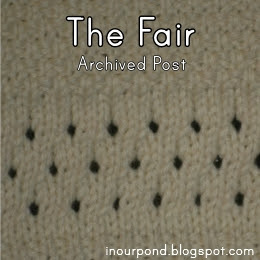 Here is another post from my old blog "A Yarn About Knitting." This one was written on Sept, 26, 2009. - stocking stitch lace pattern (whichever one you want) for about 1.5"
- knit in main body pattern for 12"
- stocking stitch lace pattern for 1.5"
- knit in main body patter for 3"
It's a really simple pattern and it's written in the same manner in which I cook (a little bit of this and a little bit of that). For the wash cloth, I cast on 30 stitches and knit in main body pattern until I had a square. The towel received a blue ribbon and "reserve grand champion" at the fair. This was my first time entering anything in the fair, so I was really surprised.